Antminer is the name of a line of proprietary mining technology produced by Bitmain Technologies, Ltd., a privately held company based in Beijing, China. Antminers are complete stand-alone computer devices that deploy a type of integrated circuit, or chip, which has been designed solely to mine cryptocurrency. Such circuits are called application specific integrated circuits (“ASICs”). Antminers have come to dominate the market for bitcoin miners. 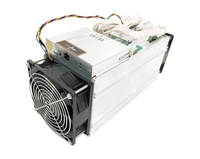 Bitmain announced in March 2018 that it would produce Antminers with ASICs to mine Ethereum, which previously had been thought to be very ASIC resistant. ↑ Best Bitcoin Miners. Digital Trends. ↑ Cryptocurrency and Mining Impace Deep Dive: Antminer E3 The End Of GPU Mining?. Seeking Alpha.